The US Securities and Exchange Commission (SEC) had put a deadline of November 5 for the public to submit their comments and opinions about Bitcoin ETFs (Exchange Traded Funds). These comments and opinions are expected to help the agency reach a decision about the 9 Bitcoin ETF applications that are pending with it. The SEC had rejected the 9 Bitcoin ETF applications on August 22 this year. These applications had been submitted by 3 different firms. Two applications had been submitted by ProShares, five applications had been submitted by Direxion and the last two had been submitted by GraniteShares. The DTCC’s (Depository Trust & Clearing Corporation’s) main Blockchain project has been advanced to its testing phase. This is one of the final steps in the project’s development before it goes live. The DTCC announced that it was going to test its Blockchain project in partnership with 15 companies. UK-based Barclays was the only company that was named as one of the testers. However, together these 15 global banks will test DTCC’s Blockchain and cloud based platform for its credit derivatives TIW (Trade Information Warehouse). Once this phase is successful, the TIW will be moved to an “open” testing phase. The Texas State Securities Board issued an emergency order to the Australian cloud mining company AWS Mining PTY Ltd to cease and desist its operations because they have been found to be selling unregistered securities. According to the official document, AWS Mining, the Chief Market Officer Josiah Kostek and the company’s agents are in violation of the state’s Securities Act. They have done so by “luring” the residents of Texas into buying the company’s unregistered mining power contracts. The document also accuses the company of having attracted customers by promising a 200% passive return for every investment made. 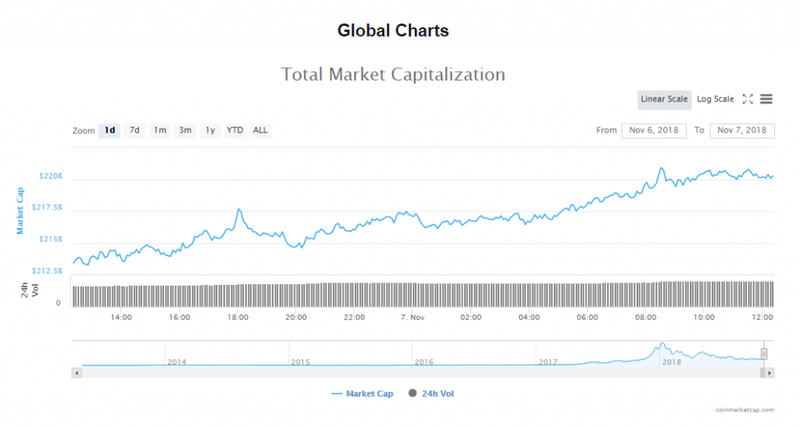 The cryptocurrency market’s capitalization has jumped by $6.46 billion to $219.94 billion. 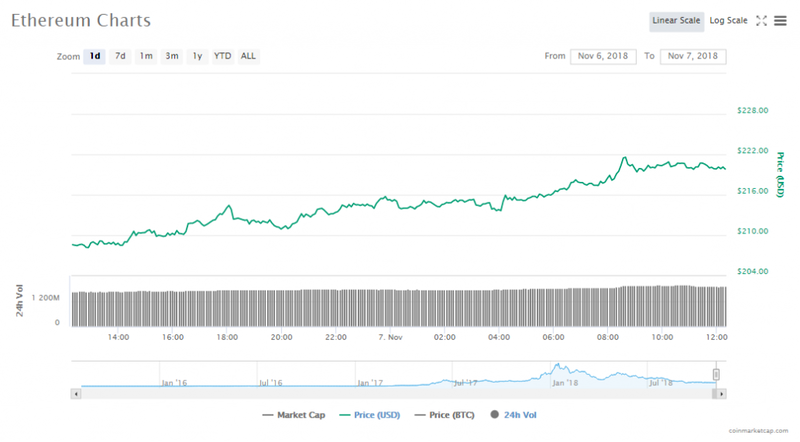 Trading volumes in the crypto market are also up by $2.99 billion at $16.26 billion. The price of Bitcoin is $6528.23 per token, a 1.62% drop increase since yesterday. BTC’s market capitalization is $113.35 billion and is trading at volumes of $4.97 billion. Ethereum’s current token price is $219.82, which is 5.42% higher than yesterday’s price. The cryptocurrency’s capitalization is $22.65 billion and its volumes of trade are at $1.91 billion. The 10 most valuable cryptocurrencies in the world have largely been trading in the green so far today. The two exceptions to that statement are Monero, which is currently down by 0.88%, and Tether, which has lost 0.18% so far. All the other top cryptocurrencies are doing well. The biggest gains have been seen by Bitcoin Cash, which has soared 10.86%, Ethereum, which is up 5.42%, and Ripple, which has gained 4.95%. Bitcoin is currently $6528.23, gaining 1.62%. The digital asset is now worth $113.35 billion. Ethereum is currently $219.82, gaining 5.42%. The digital asset is now worth $22.65 billion. Ripple is currently $0.535282, gaining 4.95%. The digital asset is now worth $21.52 billion. Bitcoin Cash is currently $619.03, gaining 10.86%. The digital asset is now worth $10.79 billion. EOS is currently $5.72, gaining 4.35%. The digital asset is now worth $5.18 billion. Stellar is currently $0.259483, gaining 4.13%. The digital asset is now worth $4.91 billion. Litecoin is currently $55.73, gaining 3.60%. The digital asset is now worth $3.29 billion. 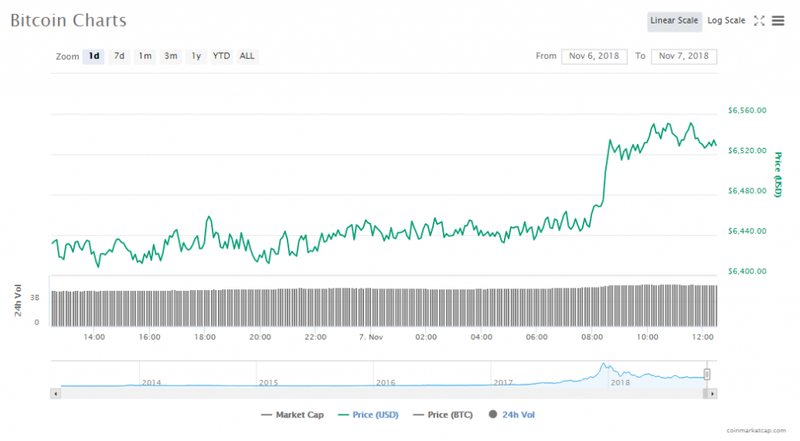 Cardano is currently $0.080444, gaining 3.76%. The digital asset is now worth $2.08 billion. Monero is currently $111.69, losing 0.88%. The digital asset is now worth $1.84 billion. Tether is currently $0.993354, losing 0.18%. The digital asset is now worth $1.76 billion. On November 15, BCH miners started the fork process. However, miners from the Bitcoin ABC group mined the first block, while Bitcoin SV miners mined the next block, leading to a split in the BCH Blockchain. To assert Bitcoin ABC’s dominance, Jihan Wu, the co-founder of Bitmain, the leading supporter of the ABC party, mobilized his mining force. In a tweet he posted on March 9, the Chief Executive Officer of Binance Changpeng Zhao indicated that his exchange could be creating a fiat-to-cryptocurrency exchange in Argentina. Public documents have revealed that the popular messaging service app provider Telegram has raised another $850 million through its ICO private sale, taking the total funds raised to $1.7 billion.